We have a 3 bedroom 8 berth holiday home on the Orchards area of the park, just a stone’s throw away from the Lakeside Showbar and the main outdoor play area. Orchards itself is a low traffic area of the site yet conveniently placed, making it an ideal pitch to be close to the action. 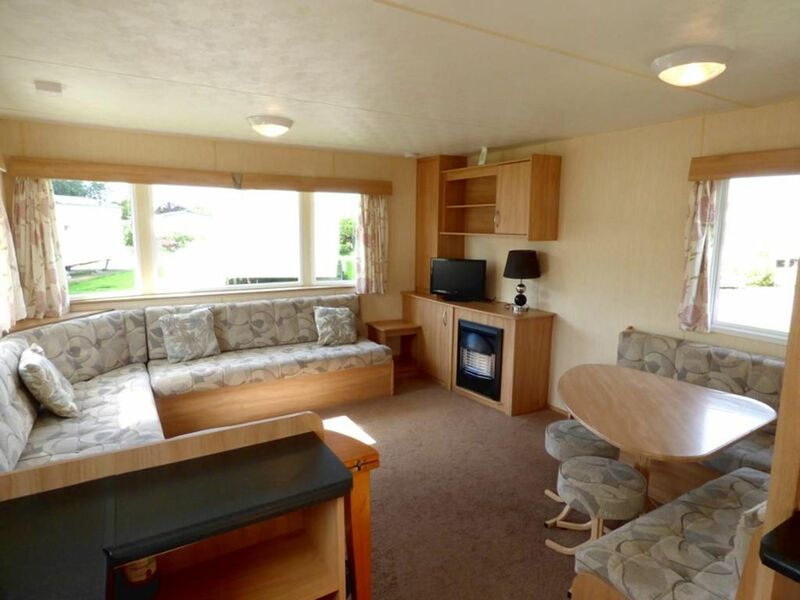 The caravan is a modern 12 foot wide caravan and the spacious layout offers everything you’ll need for a wonderful and well earned family break on Southview Leisure Park. Accommodation wise the caravan offers a double bedroom, two twin rooms and a pull-out bed in the living area. A family bathroom and second separate toilet also make life easier for larger groups and parking is conveniently located next to the caravan. To get the most out of your break at Southview Leisure Park we recommend purchasing entertainment passes; evening entertainment other activities run daily from the last week in March until November. Passes also give access to the pool and gym on site although daily access can be purchased without passes. Passes can be ordered for guests to pay for on arrival; please enquire for further details and pricing. Fishing and use of the golf course are also available for an extra fee.